It happens to all of us sometimes! We finish cooking our recipe only to find a baked on ring of cooked/burnt residue inside our slow cooker or on the base. Or maybe the inner casing of your slow cooker has stains in it? Don’t despair – we’ve got the solution! – The sooner you get it off the better! – Always unplug the unit from power source before cleaning. Most slow cooker bowls can simply be washed by hand in the sink or some are OK for washing in the dishwasher after use. Be sure to check your manual for what is safe for your model as not all models are dishwasher safe. However if you find yourself with a baked on ring around the dish that’s hard to remove the easiest way is to simply leave it on and cooking after your food has been removed. Add water to a level above the baked on ring and leave it on low for a couple of hours. It should clean away much easier then. Some suggest placing a dishwasher tablet or even a denture cleaning tablet in the slow cooker while the water is heating in it for up to 2hrs but it is advisable to check with your user manual if this is safe for your model. As with any ceramic, the stoneware and lid will not withstand sudden temperature changes. Do not fill with cold water when it is hot. Due to the porous nature of the base of some ceramic bowls do not stand it in water for extended periods as this water can be absorbed through some bases. The bowl can be filled with water and sit but not sit IN water. The metal housing of the slow cooker and electrical lead should NOT be placed in water! Be sure to completely unplug your unit from the power source and allow it to cool before any cleaning. Over time with slow cooking you will often find some of your food will splash down into the main casing of your slow cooker – under the cooking bowl. It is important to ALWAYS CHECK YOUR INSTRUCTION MANUAL FIRST as to how your manufacturer recommends you clean yours. Most electrical cables are fully sealed and not able to be touched or wet inside this base unit but still exercise extreme caution in washing this main base unit and again – never place the unit itself in water. And if you can see heating elements inside the base do not clean or add water in this area and instead contact the manufacturer for advice. – Simply wipe off with a soft, damp cloth and a small amount of dish detergent. Especially if the spill is fresh or new. – A chalk based cleaning paste like Gumption that you can purchase in a tub in your supermarket cleaning aisle. – Some report using a thin coat of oven cleaner, fume free version if you can, and leave an hour or so then wipe off clean. If doing this I would recommend wiping over a few times with a damp cloth to minimise any smells next time you use the unit. Note: caution that it could remove paint coating from the outer of your slow cooker or be too abrasive for your unit so I would use this option with caution? Rather than deal with the clean up try to prevent it where you can! – Do not over fill your slow cooker which will increase the likelihood of it spilling and staining in the casing area. 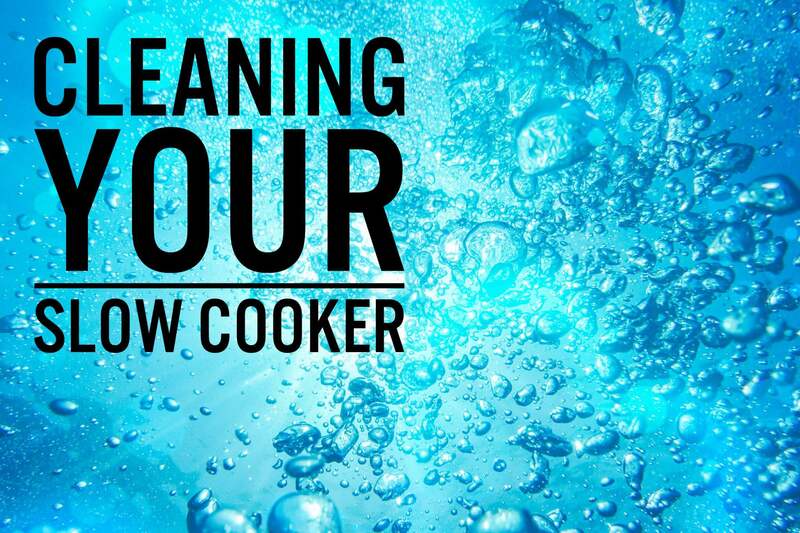 Do you have a special trick that you use for cleaning your slow cooker? I have cleaned the main casing successfully with the magic eraser. Easy to do, minimal water needed and great result! Thank you for your suggestion. I am going to try it. The main casing has a stiky orange color in it. Been wanting a way to clean it for a long time now. I will let you know how it works. Heat water and 2 tablespoons of washing soda. Rinses out like new! I accidentally washed my crockpot base (electrical part) in the sink with water. What can I do now? I would recommend having it check by a qualified electrician before use again. I used oven cleaner and not it’s not shiny in there anymore. I plugged it in & it still heats up. Will it be ok? If in any doubt of electrical safety I would always recommend you have it checked by a qualified electrician! I just clean mine with a soft dishwashing cloth, and dishwashing detergent. Wait until it’s cooked down. I use warm water, rinse in cold. What about removing mould from your slow cooker (the ceramic insert)? Is it recoverable or do I need to ditch it?